In this newsworthy addition to a tween-savvy series, Samantha learns the power of telling the truth as a budding middle-school advice columnist. 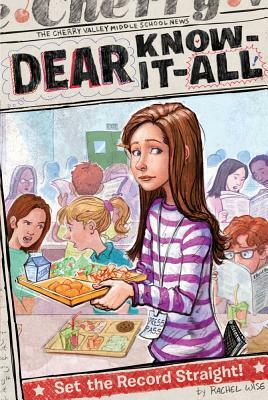 Samantha loves working on her school newspaper staff, and she especially likes her job as the anonymous advice columnist “Dear Know-It-All.” She does her best to help her readers, but when a well-meaning suggestion backfires, Sam finds herself the victim of cyberbullying: Horrible emails fill her inbox, and she feels harassed. To make matters worse, she’s doing solid reporting about the bad food in the cafeteria, but that makes the cafeteria workers hostile and upset. Does everyone hate her? On the brink of a meltdown, Sam talks to her adviser, who says she can stop writing the advice column if she wants. Should Sam quit being Know-It-All and admit defeat, or is there a way she can defend herself and keep her job on the school paper?